After the dramatic Barong performance, we headed for something totally different. 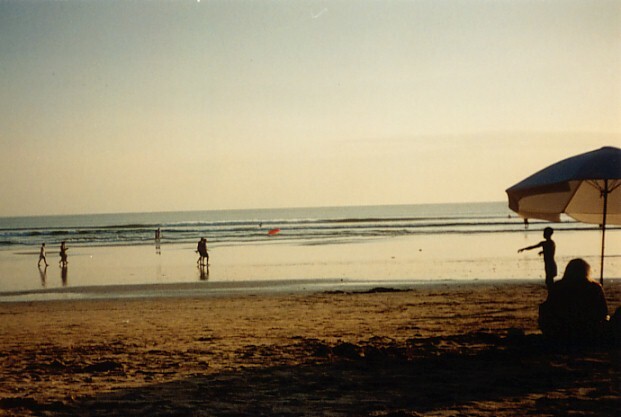 For almost three weeks we'd been in Bali, and we hadn't visited the famous (or infamous) Kuta Beach. 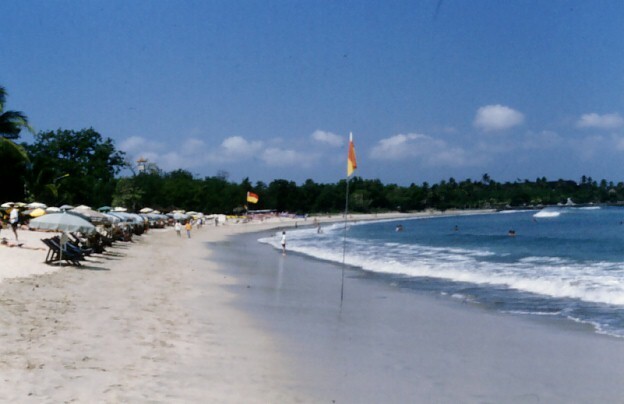 Kuta is Bali's most famous tourist beach, and the destination of perhaps most visitors to Bali. We'd heard so many horror stories about it - from the wall-to-wall people that were supposed to be there, to the rip-off artists that plied the beach preying on unsuspecting tourists, to drunken Spring break Ozzies staggering from pub to pub, that we had given Kuta a wide berth. But in the end we decided we couldn't go to Bali and not even see Kuta once. Besides, the kids had indulged us in our more cultural pursuits for all this time and wanted a day on the beach. And we had picked up some coupons for the Hard Rock Cafe somewhere. Dewa dropped us off at the end of the beach and we walked along the golden sand. It was actually a beautiful beach! There were tourists, but there was plenty of sand between them, and the water looked very inviting. We decided that maybe we'd been a bit harsh in our pre-judgement of Kuta. If you wanted to spend some time on the beach, it didn't seem bad at all. It was kind of fun watching the planes come in to land at Bali's main airport at the far end of the beach. The kids loved it. 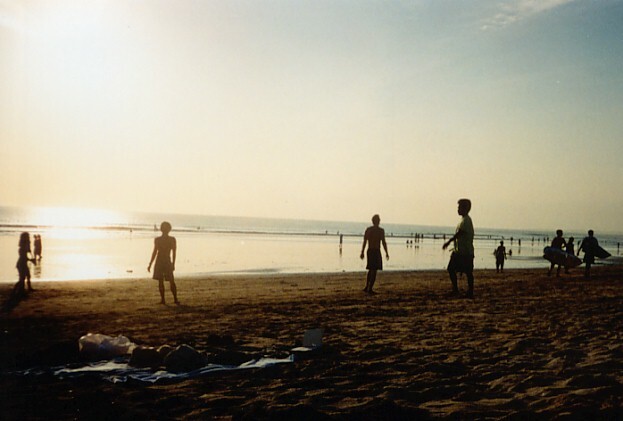 There were surfers and people throwing frisbees, and the usual fun beach kinds of activities. A few Balinese wandered by offering massages or hair braiding, but they politely accepted "no thanks" for an answer. After a while we decided to see if we could find the Hard Rock Cafe (yes, a morning of unabashed hedonism). We walked into the busy town of Kuta which runs along the length of the beach. It was filled with cheap trinkets and low-quality craft souvenirs for the not-so-discriminating tourist, and lots of cheap places to eat. The Hard Rock Cafe could be a Hard Rock Cafe anywhere, with rock memorabilia everywhere, although it did have something of a Balinese feel to it. But if you're "collecting" Hard Rock Cafe visits all over the world, Kuta's a cool place to have been. And the kids especially loved a real American meal. After lunch, Dewa picked us up again. After seeing Kuta we thought we'd check out the other main tourist resort, Sanur, which we'd heard was like a smaller, quieter Kuta. But we were quite disappointed with Sanur - maybe it was the low tide and difficulty to find a good place to swim, but all it seemed to us was a string of European-style hotels along the beach-front, full of Europeans, and a lagoon too shallow to swim in. The kids wanted to go back to Kuta to spend the afternoon on the beach, and we wanted to go off to explore Uluwatu on the southern tip of Bali. We were already used to leaving the kids on their own - Bali is such a safe place, and we felt quite comfortable leaving them on the beach for a few hours.